We all face stress – some of us more than others. And while we may never get rid of every anxious moment, there are ways we can work on relieving stress. 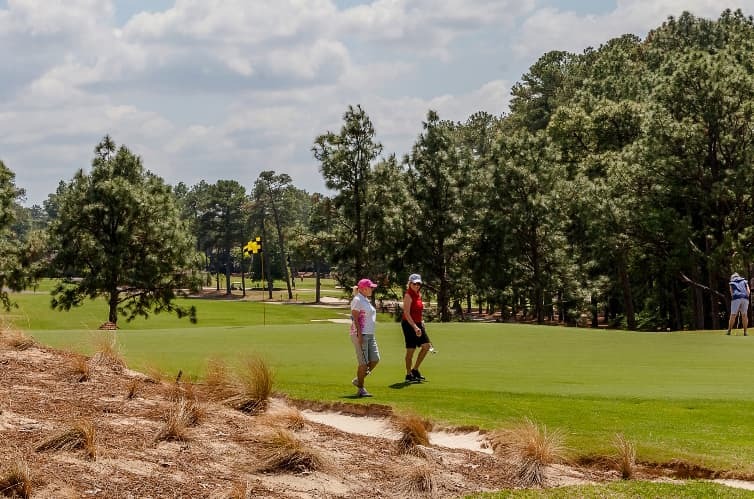 Here are five ways to do just that, and a few options where The Spa at Pinehurst can lend a helping hand. The mind, heart and body can improve with regular meditation. Taking a break from your office or daily routine to just sit or even lie down and focus on your breathing can improve your heart rate and focus. These benefits go even further when you include a quiet massage as a form of meditation. Tension and muscle tightness will depart from your body and mind and leave you feeling rejuvenated. While The Spa offers many forms of massage therapy, we recommend you try the customized massage where you can enhance your experience to suit your needs. Find ways to laugh and laugh often – obviously at the right time, of course! Laughter is directly linked to reducing stress hormones and blood pressure, as well as increasing blood flow and oxygenation to the cells and organs. Gather up the girls for a fun pedi and mani at The Spa and generate some fun-filled memories as you enjoy fruit smoothies and great company. While the spa does have a fitness center available to guests and members, we also offer Yoga and Customized Stretching. The physical benefits of yoga and stretching are endless but a few of the notable ones are increasing your flexibility, improving respiration, energy, and vitality as well as cardio and circulatory health. I am sure your bathtub at home has been used more by your kids or grandkids than yourself. It’s funny how that dream bathroom can also be a storage bin for toys. Let us help you enjoy a bath sans toys and find yourself soaking in a tub filled with pine, rosemary, arnica, and eucalyptus oils. Soaking in a hot bath relaxes your muscles, which will soothe you not only physically but mentally as well. Read about our body care therapy at The Spa. No, we’re not talking “Going off the grid.” We’re talking about putting your electronics away for the time you are at The Spa. Emails, social media and life will keep rolling on just fine without you for a few hours. Promise! Check in at The Spa 30 minutes early to relax in a fluffy white robe, enjoy a fruit smoothie and some quality time to yourself as you unplug from the world. Trust us – you will be glad you did!